The graph below is yet another reorganization. 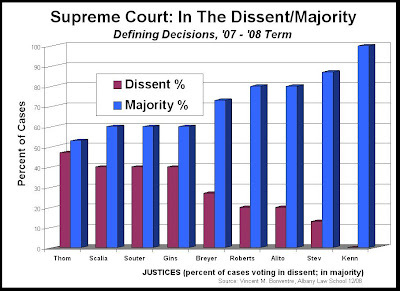 This one highlights how frequently each Justice was out of the majority--i.e., in dissent, having written or joined a dissenting opinion. Also, the frequencies are in percentages of the defining decisions. 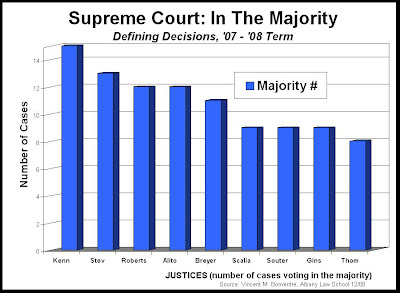 This reorganized graph will hopefully help to underscore the extent to which each Justice breaks with the Court's/majority's decisions--or did so in the defining decisions in the '07-'08 term--and the nature of those departures. The latter is, in fact, the focus of the discussion following the graph. The contrasting amounts of the two colors for each of the Justices sums it up pretty vividly. Just contrast the relative amounts of red [maroon? burgundy? garnet?] representing dissents and blue [yep, blue] representing majorities for Thomas, the first Justice on the graph; then the same for Kennedy at the other end; then contrast the two. Now that's a heck of a picture for a heck of a contrast. It reflects the difference within the Court between Thomas at one ideological end of the Court (the right/conservative end) and Kennedy in the center and as the swing vote. Look also at the contrasting amounts of garnet [I've now settled on that, since it's the color of my undergraduate alma mater, Union College in Schenectady.] for Scalia, Souter and Ginsburg on the one hand, and Roberts, Alito and Stevens on the other. The former group of three was more out of synch with the Court as a whole in the defining cases, and the latter group of three more in synch. In the next post, we'll take a look at each Justice's particular departure's from the Court majority.